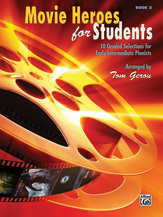 Movie Heroes for Students, Book 2, is arranged at the early-intermediate level. Sixteenth notes and triplets have been avoided. Key signatures are limited to one sharp or flat. Chords contain a maximum of three notes in either hand and simple meters of 4/4 or 3/4 allow for greater accessibility. Titles: Batman Theme * Hedwig's Theme (from Harry Potter and the Sorcerer's Stone) * He's a Pirate (from Walt Disney's Pirates of the Caribbean: The Curse of the Black Pearl) * Iron Man * James Bond Theme * Princess Leia's Theme (from Star Wars) * Raiders March (from Raiders of the Lost Ark) * Star Wars (Main Theme) * Theme from Superman * Wonder Woman.